German Postcode Lottery Gala participants. From left to right: Boudewijn Poelmann, CEO of Novamedia/Postcode Lotteries, Eva Struving, Managing Director Deutsche Postcode Lotterie, Sascha O. Maas, Deputy Managing Director Deutsche Postcode Lotterie, Annemiek Hoogenboom, Managing Director Deutsche Postcode Lotterie, Ulrich Stöcker, Head of Nature Conservation, Deutsche Umwelthilfe e.V., Hannes Jaenicke, actor, author and environmental activist, Katarina Witt, Ambassador of Deutsche Postcode Lotterie, and Frans Schepers, Managing Director Rewilding Europe. 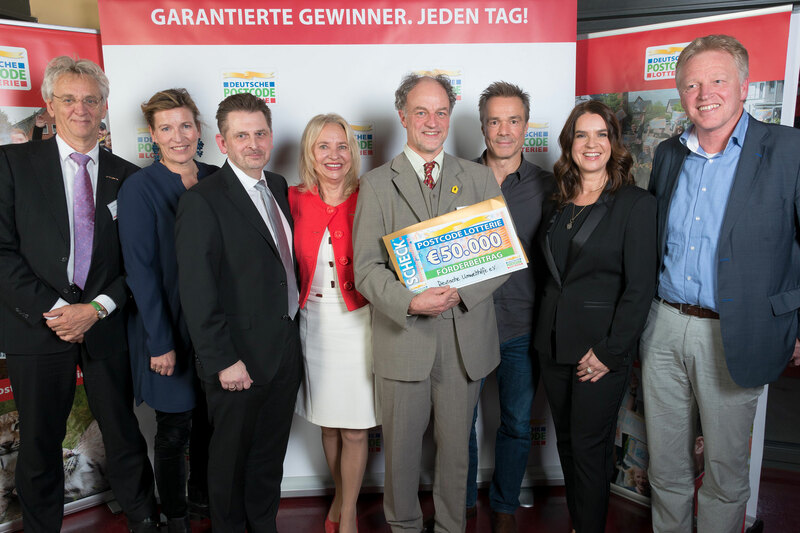 Rewilding Europe are delighted to announce that the first gala of the German Postcode Lottery, held yesterday evening in Dusseldorf, saw a cheque for 50,000 euros handed over to Rewilding Europe Circle member Hannes Jaenicke. 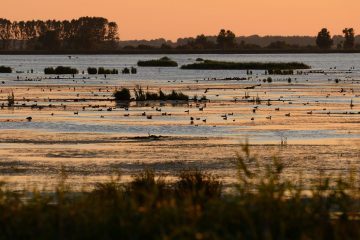 The money will go towards rewilding work in the German part of the Oder Delta rewilding area, coordinated by the German NGO Deutsche Umwelthilfe (DUH). The cheque was presented by Katarina Witt, the German World and European ice figure skating champion and a lottery ambassador. The gala, which was attended by 120 guests from Germany and abroad, presented over 300 projects, each of which received support from the German Postcode Lottery during 2017. The total value of lottery grants disbursed last year was over 3.5 million euros. 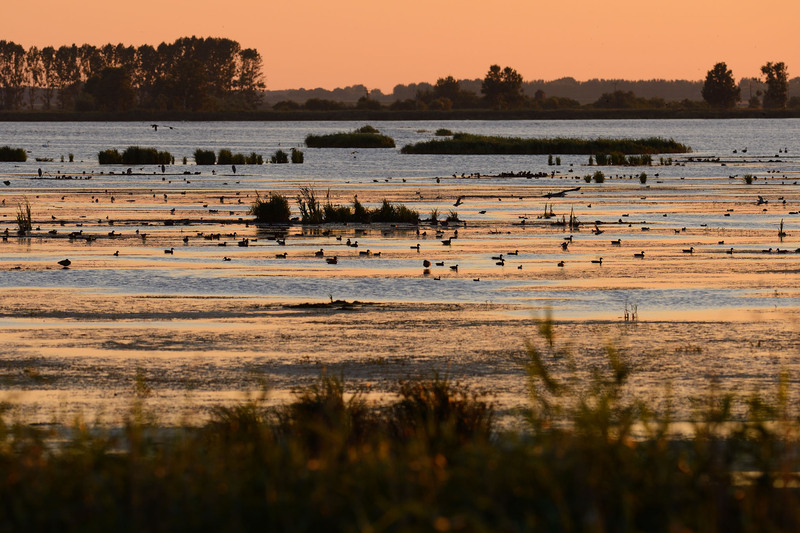 The Rewilding Oder Delta lottery grant will be used in the project “Renaturierungsmaßnahmen an Fließgewässern Stettiner Haff und Peenestrom” (Restoration measures for the Stettiner Haff and Peene River), which focuses on two of the most important wetland areas in the German part of the Oder Delta. The project was submitted to the lottery for consideration by DUH, one of Rewilding Europe’s main partners in the transboundary Oder Delta area. “We decided to fund this project because it will make a critical contribution towards the conservation of a healthy and natural environment in the delta area,” says Charlotte Platzer of the lottery’s Charity Department. Hannes Jaenicke presented the wider Rewilding Europe initiative to gala participants with a short film and speech. As a successful actor and member of the Rewilding Europe Circle, he is strongly committed to nature conservation, and has been a creative force behind numerous award-winning environmental documentaries. Stettiner Haff, Oder Delta rewilding area. Many waterways on the northeastern Baltic Sea coast of Germany are currently in very poor condition. The encouraging reintroduction of ​​species (such as sturgeon and sea trout) here means that aquatic habitats urgently need to be improved. The Rewilding Oder Delta team is now working to improve the ecological status of rivers and wetlands in the delta area, collaborating with local communities and the State Office for Agriculture and the Environment in Mecklenburg-Vorpommern (the state where the German part of the delta is located). Activities, which focus on rivers in the Vorpommern-Greifswald district, include the rewilding of river banks, the restoration of natural hydrodynamics, the removal of obstacles to support fish migration, and the re-wetting of adjacent areas. The fourth postcode lottery in Europe, the German Postcode Lottery allocates 30 percent of the ticket price to charitable causes that focus on education, social cohesion, human rights and animal and environmental protection in the winners’ federal state. A list of supported projects can be found on the lottery website here. The Postcode Lottery Facebook page can be visited here. Read more about the Rewilding Europe Circle here.